Worcester MA is teaming with talent, and this book showcases that talent. 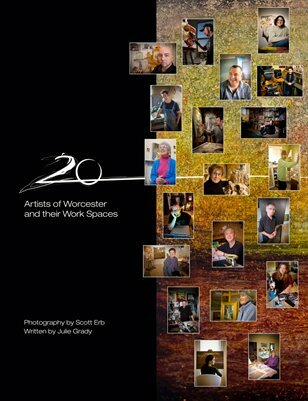 20 Artists of Worcester is an amazing array of images showing artists in their work spaces. These artists are international known and collected and there is a very broad array of work to be discovered. Scott Erb, a professional photographer located in MA, photographed the many types of artists to be found in Worcester. Everyone from traditional oil painters to photographers to sculptors to portrait painters to watercolor artists. This combined with colorful text written by Julie Grady, will give you a unique and inspiring view of Worcester artists.